Learn how to prevent fire from starting in your kitchen. No matter what time of year it is, it’s important to protect your home from fire. One of the most common house fires occur in the kitchen. In fact, a kitchen is extremely susceptible to fire for a myriad of reasons. Some are easier to see than others. 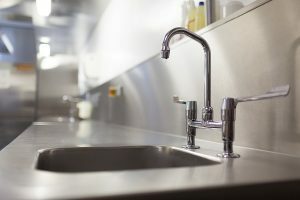 As a result, here are the steps that every homeowner needs to take to ensure that their kitchen is safe if a fire ever abruptly starts. One of the most crucial things that any homeowner can do if a fire has started in the kitchen is to notice it and be in the moment. In fact, even if a fire hasn’t started yet, there are things you can do that will prevent a fire from happening. Avoid leaving food unattended while cooking it. If you happen to get distracted or need to leave the room for some sort of emergency or any other reason, it is essential that you turn off any and all cooking appliances and also remove the cooking dishes from the heat source as soon as possible. This significantly decreases the likelihood of a fire bursting through your kitchen. Whenever you are in the kitchen whether it’s with sharp knives or hot surfaces, being careful is of the utmost importance. In fact, making little changes like avoiding billowy or oversized sleeves while cooking can significantly decrease your chance of starting a fire. If you have long hair, make it a point to keep it away from your face to prevent it from catching on fire. Securing it with an elastic is always the best idea when you are in the kitchen, whipping up some delicious treats! This entry was posted on Friday, August 31st, 2018 at 9:25 am. Both comments and pings are currently closed.